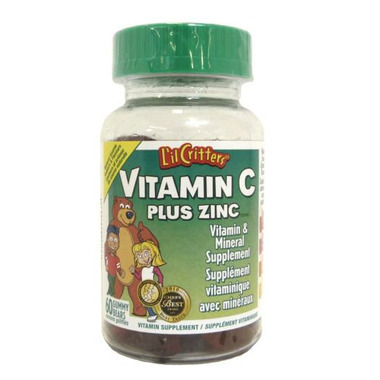 Great tasting gummy bears with Vitamin C plus Zinc for extra support when kids need it most. No artificial color, flavors or preservatives. Four great fruity flavors: Orange, Cherry, Strawberry and Lemon. My kids love these and would eat them like candy if they could. I'm sure these helped keep them cold free this past winter. Will definetly keep these on hand. My kids love these. They've had colds steadily for the last 5 months but I've noticed in the last month that they've been taking these, they seem to be less severe. A sniffle and sneeze here and there as opposed to full blown colds with ear infections and fevers. Will buy again. Great tasting gummy, good price. Nice to have the added zinc to help during cold and flu season. Really great product! Helps to fight off my kids' colds during winter time. Kids like the taste too. Wish it came in the bigger bottles though. This is an absolute "must have" every winter in our house. It quickly works to reduce the duration of the numerous cold viruses my kids catch. I give them these vitamins at the first sign of any cold. Fantastic product to help quickly boost my kid's immune system! Our boys enjoy taking this vitamin; tastes great. I choose these for them because do not contain artificial color, flavors or preservatives. My children love these gummies. I am going to reorder again for sure. These are awesome for my 4 year old - they are a great booster to get us through cold & flu season! Yummy too! great taste. kids love them. glad we can finally get them in Canada. it can never hurt to have a little more C and echinacea in the winter to fight all the bugs. My son's favorite vitramin C, he tried other brand but this is the only one he loves. He's been using this for 3 years already...Great vitamin C, it helps his immune system, I definitely recommend this. the best vitamins, my son loved it so much.